Désolé, cet article n’est pas disponible en français. Pour le confort de l’utilisateur, le contenu est affiché ci-dessous dans une autre langue. Vous pouvez cliquer le lien pour changer de langue active. 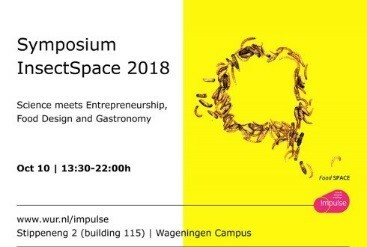 The Symposium InsectSpace 2018, organised by Foodspace, will focus on edible insects for human consumption. It will be a meeting point for Food Science, Entrepreneurship, Food Design, and Gastronomy. It will bring new ways of more sustainable eating through creative and sensorial experiences and it creates a new stimulus for entrepreneurs and food designers interested in edible insects. Besides food for thought you will have a chance to taste insect snacks during the event, and after the symposium, you can join the dinner experience with delicious dishes with insects, curated by FoodSpace. Click here for registration, programme and keynote speakers. This entry was posted in Event and tagged Edible insects,entrepreneurship,symposium.